We ll, it’s been a while since I posted but I have a good excuse. At the last minute we were able to secure a house sitter for our menagerie and on 11th December we flew over to the UK. 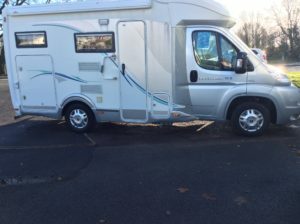 The next day we bought our first motorhome and today we picked ‘him’ up. Fondly named Bobbus – after the terms of endearment Simon referred to my Dad, we drive back home tomorrow, filled with a lot of excitement and a wee tot of trepidation. It’s thanks to my parents and their geneoristy and my Dad’s forward thinking that we’ve been able to achieve this. Not a moment goes by when I still wish he was here with us every minute of the day. But looking forward to a brighter 2017, not just for us but for everyone who has had a difficult year, especially our friends and neighbours in Italy. Oh, feels like my whole life has been an experiment, but looking forward to the next one. Roll on 2017! Feeling: Accomplished – five days into my alternative NaNo challenge for December I’ve almost finished the hand written edits, three days ahead of schedule! And we’re moving ahead with the next phase of Project Nomad… just need to find some house sitters! Feeling: Determined I’m using December to kick start my writing, well editing. Christmas is cancelled and nothing will move me from my goal.